C is applicable to Corn, C is applicable to Cake, C is also applicable to Chocolate and etc. Greetings everyone, I am C-Blackwell, some of you might have known and recognised me as CarlottaBlackwell from a few years back. I have created a new account here, because well, too many years have passed and my drawings has changed too much to be associated with CarlottaBlackwell. 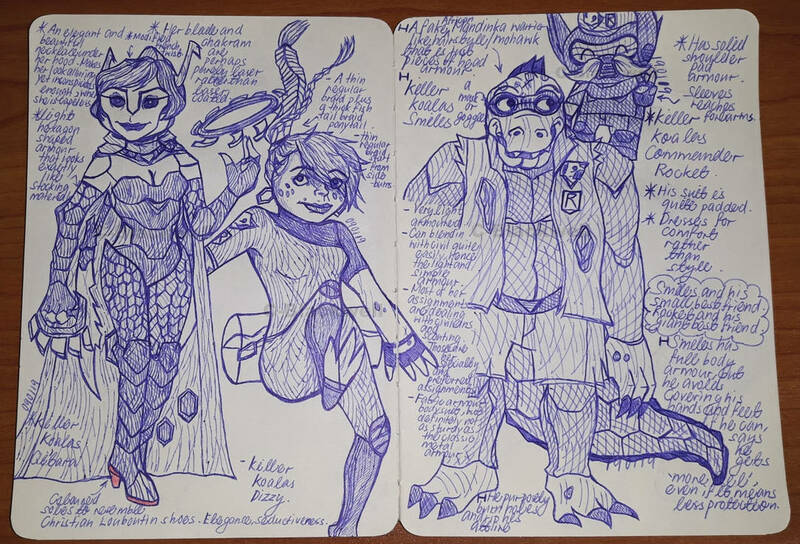 I will be posting some of my Awesomenauts drawings here. Also, my apologies for I do not take requests. Thank you for visiting my topic. Post No. 1: Ghost Leon and Other Doodles. Ghost Leon is also a Cute Leon. I Imagine that he loves a well made yet simple bread. This is what Rocco is saying to Gnaw in the middle sketch, in case the dialogue is way too small to be read. Rocco: What am I drinking? A nice glass of iced peppermint tea, my dear Gnaw. Last edited by C-Blackwell on Sat Mar 16, 2019 6:08 am, edited 5 times in total. Post No. 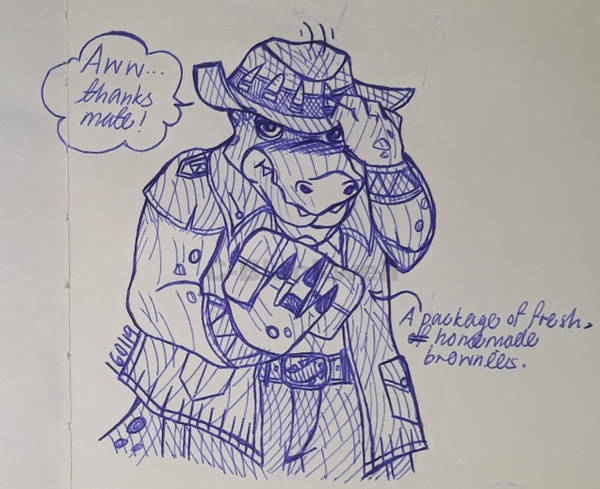 2: The Australian Hunters' Banter, and Other Doodles. I really mean it, I love and accept the canonical and official designs of Awesomenauts. However, sometimes I tend to alter the design a bit when I draw them, it is either for fun or due to the reason that I happen to be not really comfortable with myself drawing some of the designs. I hope you all understand. I actually do not know what Rocco's accent is, so I asked around and people told me that Rocco's accent is Australian accent. Smiles is canonically an Australian. I know Smiles is actually quite scary, but he is a friendly and funny crocodile in my head and I like playing as him. And they are just two Australians, predatory animals drooling over food. My apologies if that is not the correct way to eat bush tomatoes. Soulhuntress Raelynn, Skull Chopper Chucho and ESC Rocco. I wonder about Raelynn's hairstyle under the hood. I just drew her in a simple braid. I also wonder how Chucho looks like under his wide brimmed hat. I only give him 2 eyes since I follow human skull structure. I like his Skull Chopper voicelines, just simply cute and adorable. His lisp just makes everything cuter. It seems like this is the second time I drew Rocco with a glass of iced peppermint tea. Well, iced peppermint tea is a nice drink to have during hot weather. Pardon me if he looks a bit scary. Last edited by C-Blackwell on Sat Jan 19, 2019 4:01 pm, edited 1 time in total. I'm sorry no one has responded to these amazing drawings yet. Your drawing book is amazing. It reminds me of Nathan drake's and his was just a video game but I loved to just flip through the pages. Please post more even if it isn't Nauts related. My goodness! Thank you so much for the compliments! It's making me blush, in a good way! I feel very honoured that you like my drawing book along with the drawings, along with the comparison to Nathan Drake's journal. Also, for Ronimo Games Forums, along with in this Awesomenauts section of the forums, I shall only post Awesomenauts related art. However, I shall let you know should I have any other sites in which I post drawings which are not Awesomenauts related. Post No. 3: Killer Koalas Rocket Renegades, Wicked Coco and Shy Smiles. * Loads of explainations and headcanons ahead, feel free to skip. I like Killer Koalas design. So, I imagine an alternate universe in which the Rocket Renegades join Killer Koalas. They are just designs for fun, and I am very certain that if they were to have official Killer Koalas design, it will be much, much better designs than mine. Now, headcanons and explainations part, you may skip this wordy part if you desire. All the members wear Killer Koalas and Rocket Renegades logo on their uniform/armour. to show their allegiance. 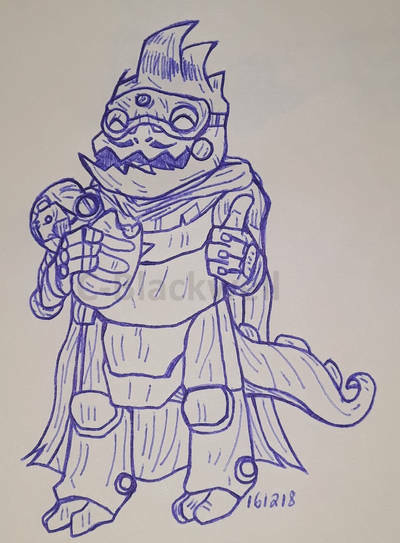 I imagine Rocket Renegades as a very small sub division of Killer Koalas, should Killer Koalas undertake missions that require a team with a variety of skills and really good communication and synergy, Rocket Renegades is always chosen. In this alternate universe of my imagination, most of the things are pretty much the same as the canonical story, save for a few changes. Rocket Renegades joined Killer Koalas, a group of elite (and perhaps heroic and noble) soldiers, instead of the canonical Awesomenuats. Rocket Renegades is formed before they join Killer Koalas, perhaps when they escaped from Scargo Military and the Scarg Emperor from a crime that they did not commit. Overall, Qi'Tara's armour is more inconspicuous, and less sharp and femme fatale looking, more emphasis on elegance. I also think that I made Qi'Tara a bit too French looking. Dizzy's armour is quite inspired by Cyber G's, albeit with some changes. Her overall design is also slightly inspired by 1990s to early 2000s fashion. 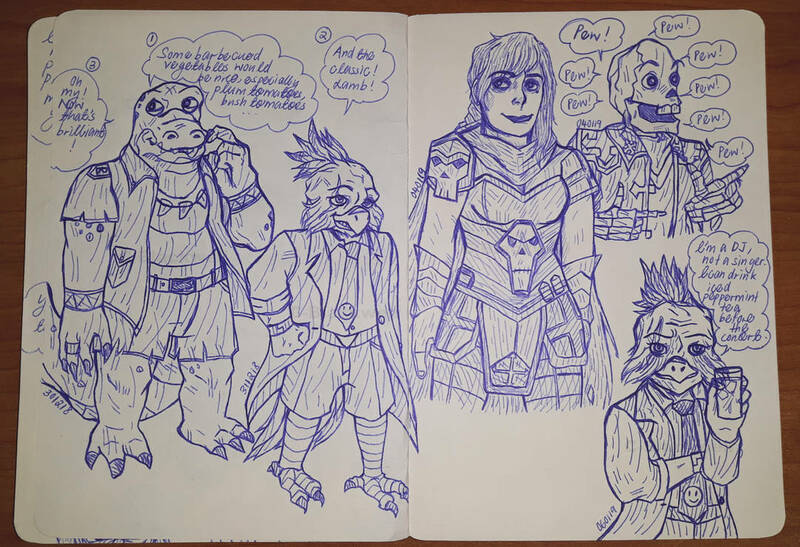 Smiles and Commander Rocket's design might be a bit bland, due to me not having much ideas for them but also do not want to leave them out of their fellow Renegades dressing up as Killer Koalas. Not much ideas for Smiles' design, other than having always wanted him to wear a mask or goggles. Smiles' design is mainly inspired by B. 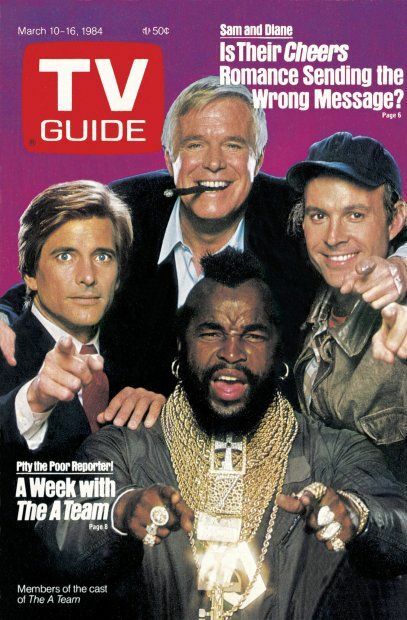 A. Baracus (The A Team). I am pretty sure that his faux mohawk/African Mandikan warrior hair, which is also "hair"/armour can be weaponised, pretty sure headbutting anyone with that is painful. I also don't know if I want to put jewelleries on him, like B. A. Baracsus, but I ended up opting against it. Smiles purposely burn his shirt and his shorts for aesthetics purpose, however, some of the burns and rips are completely unintentional, from missions, trainings and so on. Why do Smiles wear ripped shirt and trousers over his armour? Quite similar to how he would not wear armour over his hands and feet if he can so that he can feel the world more. He just finds that the armour that he needs to wear, looks too polished and doesn't look exactly like him, even though the armour is wore out of necessity, for protection since he always fight enemies at a very close range. Not much ideas for Commander Rocket's design too, but I was thinking of Dokkaebi's and Vigil's armour from Rainbow Six: Siege, and also the blast suit, but still retaining mobility. I also just want him to be cute and padded. I don't know, Rocket gives me an impression that he might be someone who is a bit of an eccentric and also funky. Perhaps he opted for a darker coloured head prosthetics this time, with tuffs at his "ears" part, looking like a koala, befitting Killer Koalas' mascot, he is tiny! XD And I am sure he is fit to be called an elite soldier. A koala on the jazz! I might work on the design if I have time and still am interested in them. 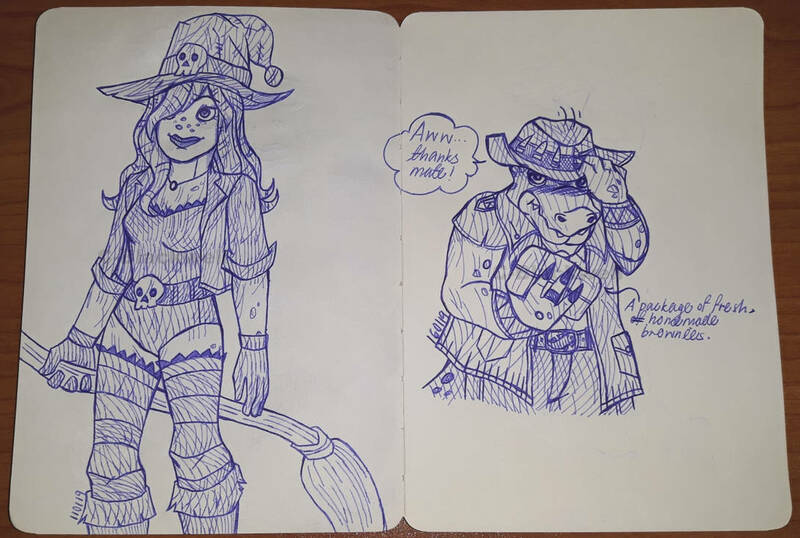 These two drawings are actually not related at all, but if I were to crop out Wicked Coco by itself, it will look very awkward due to Smiles' speech bubble getting in the cropped image. 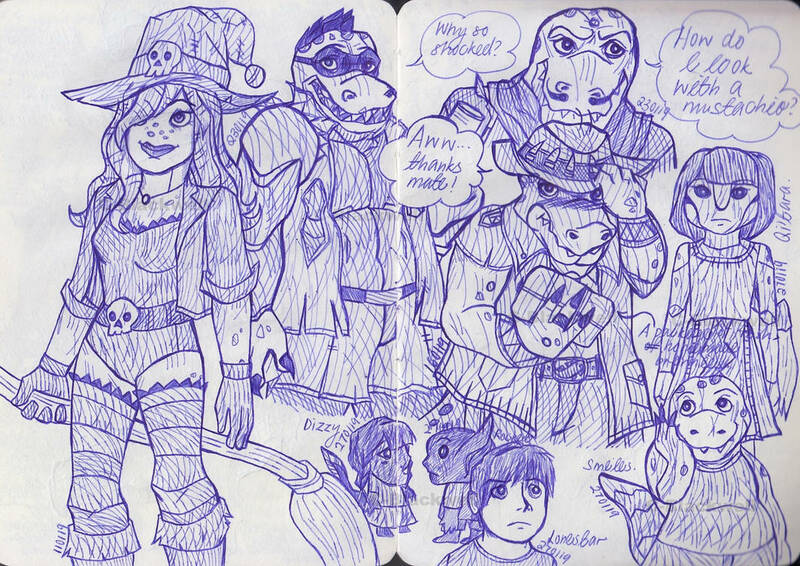 And I am also trying to avoid over-cluttering my drawing book per page. I tried to make Coco a little bit more curvaceous and fuller but failed. Looks like we will have a Coco who is somewhat akin to Cindy Crawford during 1980s then. Pretty sure her broom is bendable. Also, do you know that I made a dumb mistake of mistooking Smiles as a crocodile when he clearly states that he is an alligator when asking for help? No wonder I keep on wondering why he looks so smooth when I compared him to photos of crocodiles. Pun, intended, shy Smiles. Smiles making a shy smile. 1. He is an alligator. 2. He hunts a lot of things. 3. His tendency to burn things. 4. The prosthetics that he has. It is actually quite rare that people look pass his intimidating exterior and find his sweet and soft heart inside, so, whenever someone does that, he tends to melt inside, sometimes he shows it, sometimes he doesn't. But, he will definitely melt completely when someone not only likes him for who he is, but even gives him a present as precious as a parcel of fresh homemade brownies. Feel free to imagine who the giver of brownies is. Can be a secret admirer, a friend or anyone. And thank you very much if you take your time to read all the explainations and headcanons of mine. If not, regardless, thank you for visiting my drawing book thread. Last edited by C-Blackwell on Mon Feb 04, 2019 1:24 am, edited 1 time in total. Post No. 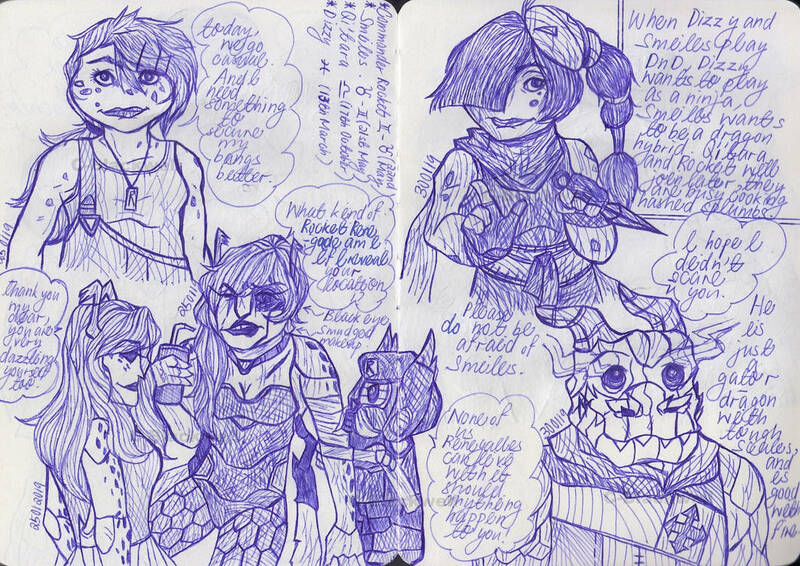 4: Drawings, Qi'Tara, Dizzy, Photoshoots and Doodle. Greetings, everyone! Apparently, I have access to a scanner for a while. I ended up filling up the page from before, it just feels nice to look at a page well filled out. 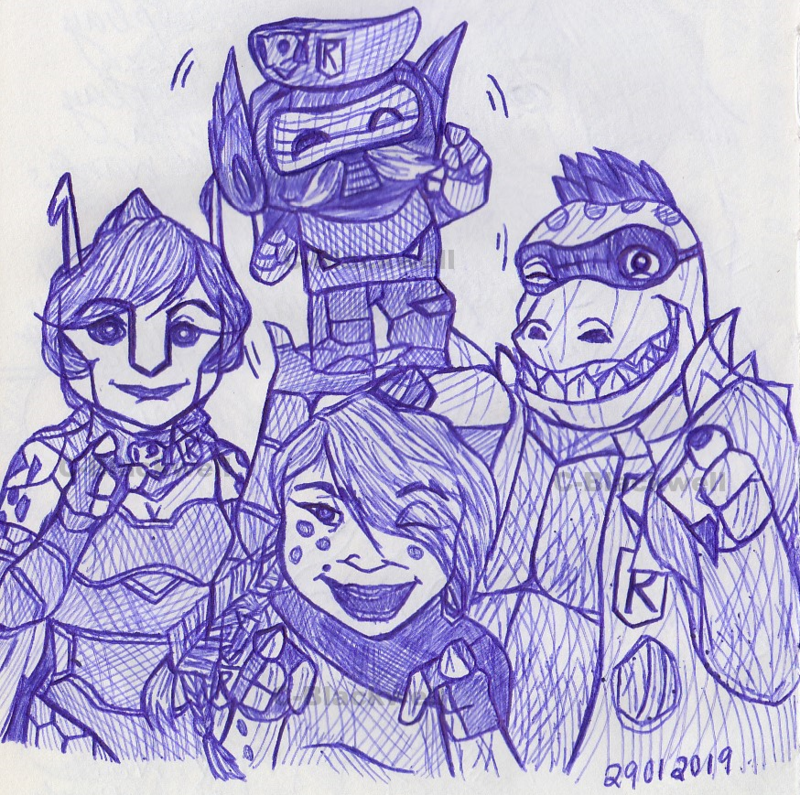 And I drew the Nauts as children for fun, and I have no idea at all how Rocket's original head looks like. I have a feeling that Qi'Tara might be someone who does not like to ask others for help. And also, I imagine Rocket Renegades' birthdates and zodiacs for fun, and are also subjected to changes. Commander Rocket - Gemini-Taurus cusp (22nd May), age:54-56. May is Taurus, some states that it is Gemini. And I base his birthdate on Mr. T's birthdate, who is B. A. Baracus's actor. I just like his birthdate. ], age: 36-39. Qi'Tara - Libra (17th October), age: 31-34. Dizzy - Pisces (13th March), age: 26-29. I am not exactly sure of the symbol of Pyromancer Smiles' outfit. I heavily referenced and based my drawings on the original The A Team photos. When a pose works well. When a pose just doesn't work at all, and also when I got the proportions of characters completely wrong. Rocket is just being himself. Qi'Tara is good at giving an impression that things work well. Dizzy does not know where she should put her hand due to how small Rocket is, and it aggravates her to be required to be completely still when taking photos. Smiles also doesn't know where he should put his hand on Rocket, so he just literally lay a finger on Rocket. And he is also displeased with the photoshoot idea. Quite self explainatory, Dizzy uses water in her fighting technique, while Smiles use fire. When combined, they become steam in the middle of the drawing. It is a drawing done when I was exhausted, hence pardon me for the quality. And, it seems that drawing style can be quite inconsistent. Thank you for stopping by, have a nice day! Last edited by C-Blackwell on Mon Feb 04, 2019 1:26 am, edited 1 time in total. Just came across this. Love how you draw Smiles and Qi'Tara! She is my fave naut. I always imagined Smiles as someone mainly gruff and stern; but your take is super cute! It is nice to know that someone's favourite Naut is Qi'Tara, because I hardly see any fanarts of her anywhere, and wonder if anyone like her at all. My favourite Naut (which is also quite obvious) for now, is Smiles! There is nothing cuter than a chubby alligator. 'sides, I like his playstyle. My oh my, I realised that I have spelt Qi'Tara's name wrongly, I need to change it! Neh, I just happen to like my things neat and tidy. If it is you who gave Smiles the brownies, I believe that he is on his way to hunt you down to...THANK YOU FOR THE BROWNIES!! AND ALSO TO GIVE YOU A HUG!!! EMBRACE IT OR RUN FOR YOUR LIFE!!!! Post No. 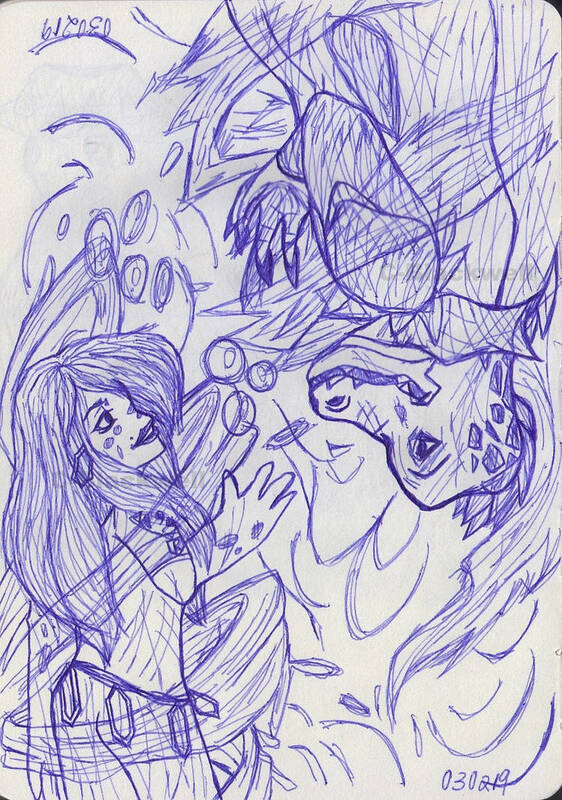 5: A Quieter but More Compiled Post of Drawings. Greetings everyone, I have been busy as of late, hence I did not post for quite some time. And I happened to draw a lot of Soulhuntress Raelynn. I have posted some of the drawings before, but I like how both the old and new drawings look together in a full page. 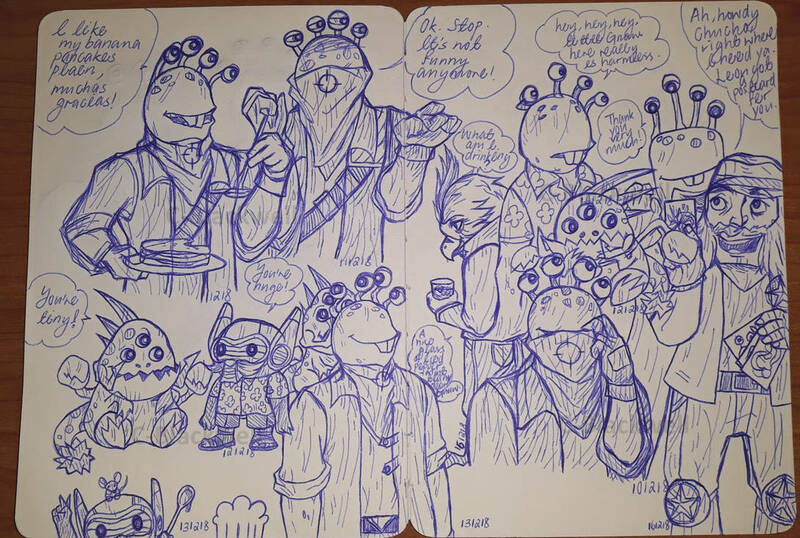 I have added some Lonestar doodles at the bottom. I jokingly imagine that Lonestar calls his holographic bull Buck. 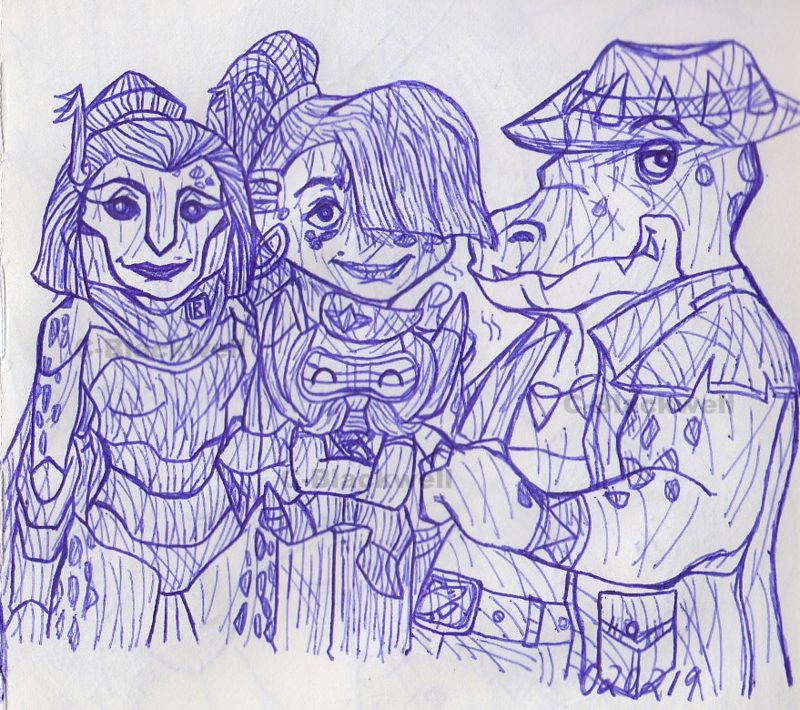 A drawing of Officer Lonestar and his holographic bull (I was thinking of mounted officers, or officers on horses), and also a Professor Yoolip, a serious and not absent minded Professor Yoolip, and a female Professor Yoolip. Left: A design of female Professor Yoolip for fun. Right: I am just imagining what it would be like if they resolve their misunderstanding, and also if Chucho ended up not catching Professor Yoolip when he realised that he time-travelled by pure accident. Chucho just felt guilty for kind of making Professor Yoolip's life miserable, when he mistook him as a time travelling criminal. A Soulhuntress Raelynn intimidates her enemies. She is saying "Ready to face justice?". A Skull Chopper Chucho laughing at some jokes. More Soulhuntress Raelynn. I imagine that as a soul hunter or huntress, they are somewhat a bit "dead", they are still alive, but some of their biological properties are slightly different. For example, as per the right drawing, Soulhuntress Raelynn can drink some of the healing elixirs meant for the dead in order to heal herself, and not die from drinking it. However, she is still mostly a typical mortal human, that can die from natural human aging. A doodle of female Lonestar, Lonestar getting read for an event and a napping Skull Chopper Chucho. The drawing on the top left is my fanart to Foxwolf333's Rexic Valentine's Day 2019 submission, that I like very much. I have received his permission to submit the artwork. I just imagine Chucho eating the box of chocolate after a Valentine's Day photoshoot to promote Awesomenauts. I guess Lonestar is a bit awkward in photos. Some Chuchos. I cropped out the finger on the second drawing, since it kind of interferes with my other drawing. Soulhuntress Raelynn with different shading technique. Skull Chopper Chucho with different shading technique. Last edited by C-Blackwell on Thu Mar 21, 2019 2:15 am, edited 1 time in total. Well actually, all your drawings are wholesome! I dare say you have a better understanding of humanoid anatomy than Ronimo! Although if I were to make a suggestion, try slimming down the faces a tad.